The Bees are back on tour with their giant, portable murals! Beehive collective's graphics aim to draw-out the connections between colonial history and present day struggles against corporate globalization, violence, and racism. The Beehive creates anti-copyright graphics as tools for popular analysis, education, and organizing. This fall a visiting Bee from the Polinizaciones project in Abya Yala (South America), who is also a member of the Ríos Vivos Movement in Colombia, is heading out on tour to the Pacific Coast of Turtle Island (North America) and then onto the Florida pensinsula (southeast US). This collaborative tour will share stories from Ríos Vivos Colombia, the social movement of dam impacted communities that struggle for the defense of their territories and rivers, and for an energy model by and for the people, and also the work of Polinizaciones, a Beehive grassroots process that collaborates with communities impacted by resource extraction in the use of arts, culture, and communications as strategies for land defense in Colombia, Ecuador, and Venezuela. Using Beehive graphics and other culture and communications work, Polinizaciones creates another way to learn, create, and understand our history in the context of globalization and free trade, militarization, the war on drugs, and the infrastructure and extraction projects integral to IIRSA-Project Mesoamérica. The Polinizaciones sharing session will highlight the Beehive's giant banners, accompanied by photographs, short films, personal experiences, and stories about the communities in resistance we have been weaving relationships of mutual aid with over the last eight years. Throughout Abya Yala, Beehive graphics are being used by youth and community educators within Native, Afro descendent, rural, and urban poor communities as a medium for dialogue and raising consciousness around the current threats against these communities. The Ríos Vivos Movement in Colombia is just one process that has appropriated Beehive collective graphics as part of their movement. 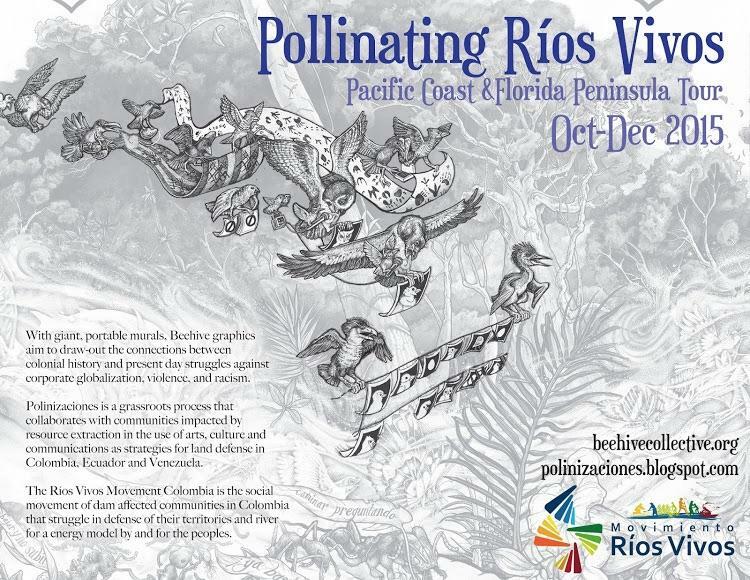 The Pollinating Ríos Vivos Tour is also available and excited at the opportunity to be able to do presentations in Spanish.